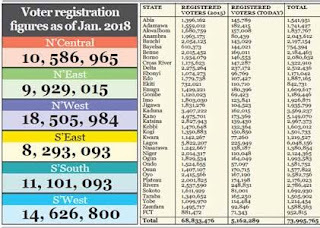 Statistics obtained from the Independent National Electoral Commission (INEC) have shown that the north-west geopolitical zone has the highest number of registered voters in the country with a total of 18,505,984 voters. According to the statistics which were obtained by Punch, in second position is the south-west zone, with 14,626,800 registered voters. On a state-by-state basis, Lagos leads the pack, with 6,048,156 registered voters, with Kano taking second place with 5,149,070 voters. Bayelsa occupies the bottom spot with 754,394 registered voters, while the Federal Capital Territory has 952, 815 registered voters. 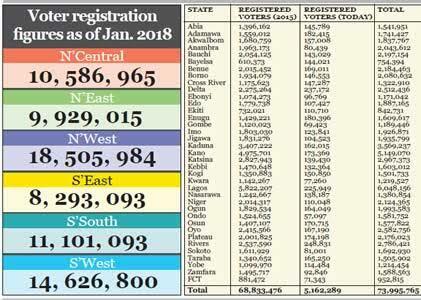 The total number of registered voters across the country so far stands at 73,944,312; but INEC projects that the number might increase before the December 2018 deadline for voter registration. The electoral commission has also stated that a high number of individuals are yet to pick up their Permanent Voter Cards. In Lagos alone, 1.4 million PVCs have not yet been collected.